While we appreciate and love our mothers every day of the year, Mother’s Day gives us a chance for us to show her how much she really means to us. While flowers and chocolates are a tradition (that shouldn’t be ignored), there are some other things that moms will love even more than that. Here are a just a few things that will show her how much you appreciate all the hard work she does for the family. One of the most important things to give her is time to rest, so let her sleep in! Take the kids out for breakfast so that your home will be nice and quiet. Another option, while she’s sleeping, whip up something simple and delicious for breakfast in bed when she does wake up. Being a mom is a stressful job so arrange for her to have a little vacation day! Once place you can never go wrong: the spa! The options there are endless from massages to facials, there’s sure to be something she’ll enjoy. Take it a step further and turn a room of your home into a spa. Gifts come in all sorts of different shapes and sizes. The perfect gift for moms is one that is personal and from the heart. So whether it’s a handmade card or an engraved keepsake, she’ll be sure to treasure it forever. At the end of the day, there’s nothing better than a nice, quiet evening at home for the ones she loves the most. Choose a movie that the whole family will enjoy! Bring out those board games you all used to play. Show off your skills in karaoke. 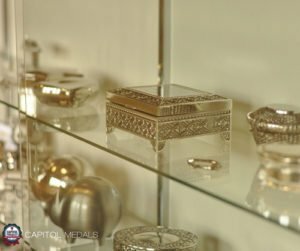 At Capitol Medals we offer a wide variety of commemorative and keepsake gifts. We specialize in custom engraving ideal for personalizing items from our extensive catalog. We can also engrave items brought in. Contact us today for your custom engraving needs for Mother’s Day or any other special occasion.